Our stoles in black with maroon trim make for a magnificent way to really bring your outfit together, letting you walk in confidence. With graduation just around the corner it is time to start thinking about how you want to represent yourself at what is most likely your biggest accomplishment yet. Here at Honors Graduation we strive to help students look phenomenal as they join their peers and accept their degree or diploma. We have all of the basic necessities that most students are required to wear in order to be able to participate in their graduation ceremony. At the very minimum, it is usually mandatory for graduating students to wear a graduation cap along with a gown for them to walk with their fellow graduates. We know just how hard you had to work to reach this point so have made shopping for your graduation attire as easy as possible. In addition to our bundle deals including all the basic gear you will need, we also have some great ways to accent your graduation wardrobe. Our graduation stoles can be the perfect way to compliment the rest of your outfit on your big day. 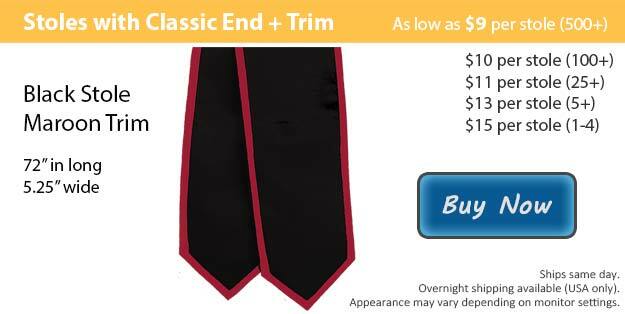 We have two different styles of graduation stoles available, there is the classic cut and there is an angled option. We have plenty of colors to choose from, whether you want a solid colored stole or one with a contrasting trim, we have the perfect option for you. If you wish to customize your stole, we can embroider the image or wording of your choice to create the unique design you come up with. Our custom stoles are a great way to match your peers if you are in a special groups or club, and afterwards you have the perfect keepsake to be reminded of all the great times you had as well as how much you have accomplished.